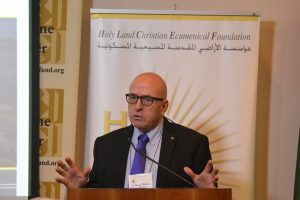 Since its founding in 1998, the Holy Land Christian Ecumenical Foundation (HCEF) has dedicated itself to “the continued presence, empowerment, and wellbeing of Arab Christians in the Holy Land and to developing the bonds of solidarity between them and Christians elsewhere.” It performed its mission with the assistance of volunteers and in partnership with a variety of Christian, Muslim, and secular institutions and organizations. 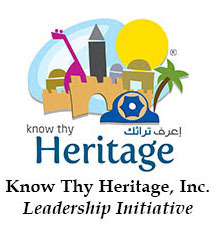 These include the Roman Catholic Archdiocese of Washington, Evangelical Lutheran Church of America, Episcopal Peace Fellowship, U.S. Muslim & Christian Coalition, Clergy Beyond Borders, Arab American Institute, Arab Center Washington, DC, Arab American Business Council, Know Thy Heritage (KTH), Organization of Islamic Cooperation (OIC), and National Presbyterian Church (NPC). NPC is actually the mother church of HCEF, which opened its doors to HCEF since its inception and supported it—financially, morally, and spiritually. The results have been rich, ranging from projects focusing on creating economic opportunities, advancing education, building and renovating houses, and developing the healthy growth of children to convening important meetings and conferences and publishing significant works, such as Michel Sabbah’s Faithful Witness: On Reconciliation and Peace in the Holy Land and What Jerusalem Means to Us. This year, 2018, is pivotal as HCEF celebrates its 20th anniversary. It is an important juncture to learn from the past and chart the future. As is indicated in its name, HCEF’s center is the Holy Land and Jerusalem is its heart. 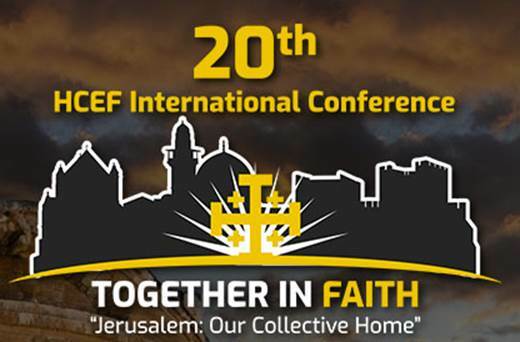 It is no surprise that HCEF’s 20th International Conference addressed the Question of Jerusalem since Jerusalem joins the three Abrahamic faiths of Christianity, Islam, and Judaism. 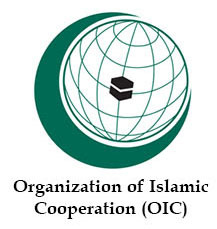 It is natural for HCEF to partner with the OIC as it protects the interests and holy sites of Islam, including in Jerusalem, “in the spirit of promoting international peace and harmony among various people of the world.” It is equally natural for HCEF to partner with KTH as it endeavors to “create a legion of Diaspora leaders who are rooted in Palestinian culture, history, and traditions, and who are devoted to serving as Ambassadors of Peace and Justice internationally.” Among KTH’s goals are to build relationships between Palestinians in the Diaspora and the Homeland, strengthen the concept of Palestine (including Jerusalem) as land of opportunity and sanctity, and promote Palestine as a priority destination for all Palestinians. Below is the conference report, covering the two days as well as the 20th anniversary celebratory dinner that was held the evening of Friday, November 2. 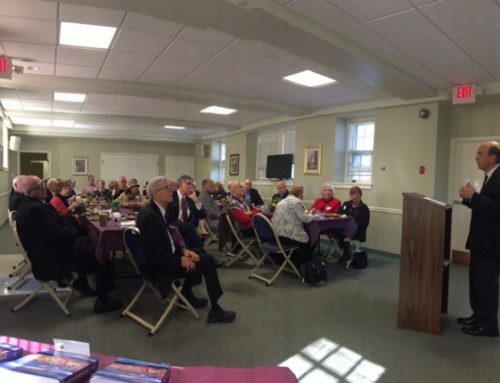 In addition, it provides a short summary of a meeting that HCEF held at the National Presbyterian Church on Sunday, November 4. The 20th International HCEF Conference was convened on Friday, November 2, 2018. The welcoming remarks by Prof. Saliba Sarsar (Chair of the HCEF Research & Publication Committee and Professor of Political Science at Monmouth University) and Dr. Stephen Corbin (former HCEF board member and Special Olympics Senior Vice President for Community Impact and Support who is a Living Faith Lutheran Church Elder), emphasized that this year is special, both because HCEF is celebrating the 20th anniversary of its dedicated support for Palestine and because this year’s conference is an interfaith event held in partnership with the Organization of Islamic Cooperation and Know Thy Heritage, Inc. Her Excellency Dina Kawar (Ambassador of The Hashemite Kingdom of Jordan). In his speech, Ambassador Mehdiyev quoted Faisal Husseini, a renowned Palestinian statesman, who observed that Jerusalem could become “the black hole of the Middle East ” if injustice continues. Pointing to the ongoing, systematic Israeli effort to Judaize the entire city of Jerusalem, the Ambassador remarked that this effort, if successful, will pervert the true character and significance of the Holy City. Ambassador Mansour stressed the paramount role of international law and UN resolutions in achieving a just peace. The U.S. has removed the question of Jerusalem from the negotiating table in spite of its rightful place as part of final status negotiations. Ambassador Kawar agreed on the necessity to reserve Jerusalem for final status negotiations. She added that the role of the Hashemite Kingdom of Jordan is to serve as guardian of the holy sites of Jerusalem, both Muslim and Christian; for example, King Abdullah funded the restoration of the Church of the Holy Sepulchre. All three speakers emphasized that East Jerusalem must be the capital of the State of Palestine. The Plenary Session, “What Jerusalem Means to Us: Christian and Muslim Perspectives and Reflections,” was moderated by Father Michael McDonagh (Advisor to the Apostolic Administrator of the Latin Patriarchate of Jerusalem). It featured the heartfelt views of religious leaders, Christian and Muslim, on the spiritual significance of the Holy City. Father McDonagh introduced the session with the exhortation that all who regard themselves as “chosen” must understand that being chosen by God means an obligation to be set apart for godly holiness, not for financial or military dominance. Then each panelist offered his own faith-based viewpoints. 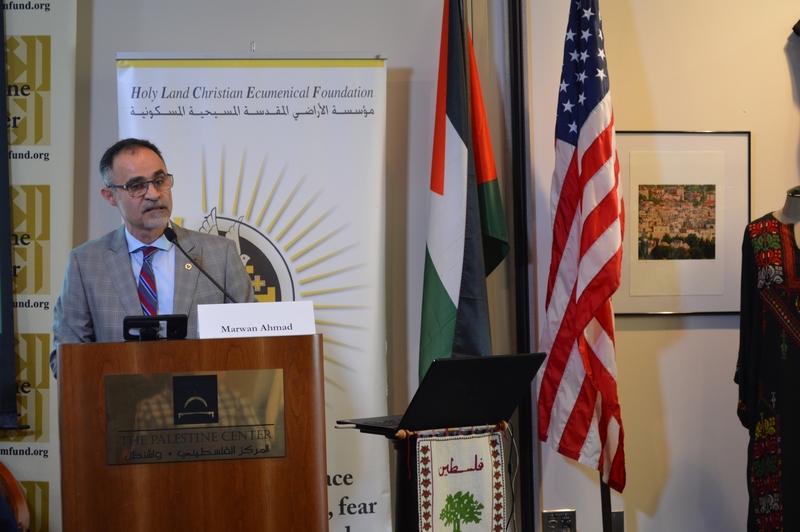 Imam Yehia Hendi (Muslim Chaplain at Georgetown University) set forth the powerful reasons why Al Quds (“the Holy,” the preferable term for the Holy City) is deeply sacred to all followers of Islam around the world. Muslims will accept nothing less than East Jerusalem as the capital of a Palestinian state. Rev. Dr. David A. Renwick (Senior Pastor, National Presbyterian Church) recalled his change of heart decades ago, when his perspective was transformed from a traditional Calvinist rejection of holy places to his present understanding. His Christian belief in an incarnational God is entwined with the Biblical truth that the divine presence is revealed to particular people in particular places—the foremost of these places being Jerusalem. 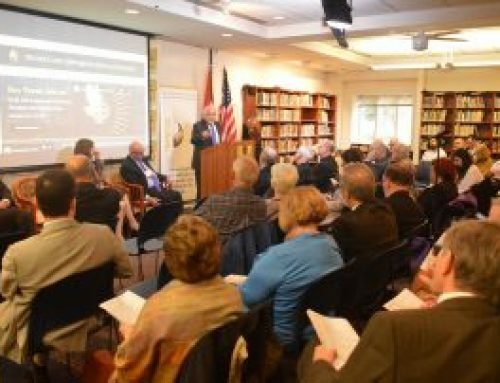 Father Drew Christiansen, SJ (HCEF Co-founder and Distinguished Professor, Georgetown University), noted the special significance of Jerusalem in Roman Catholic teaching. 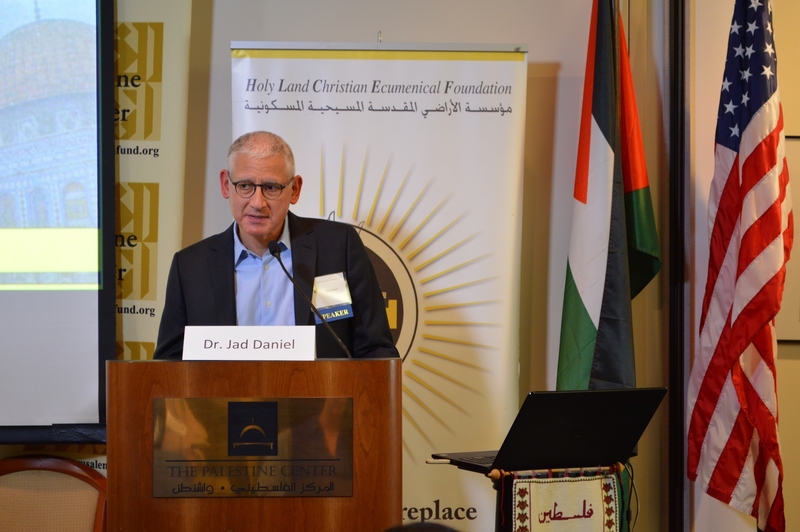 He called attention to the letter of protest recently sent by a joint task force of Lutheran, Episcopalian, and Catholic leaders strenuously objecting to the U.S. decision to terminate aid to Palestinian hospitals and clinics. Bishop Richard A. Graham (Evangelical Lutheran Church in America, Metropolitan Washington, D.C., Synod) observed that many Christians tend to focus on the Jerusalem of Biblical history and to envisage the heavenly Jerusalem of the future, but ignore the people living in Jerusalem today. Their view of Jerusalem as a kind of theme park blinds them to the needs of the diverse inhabitants of the city. 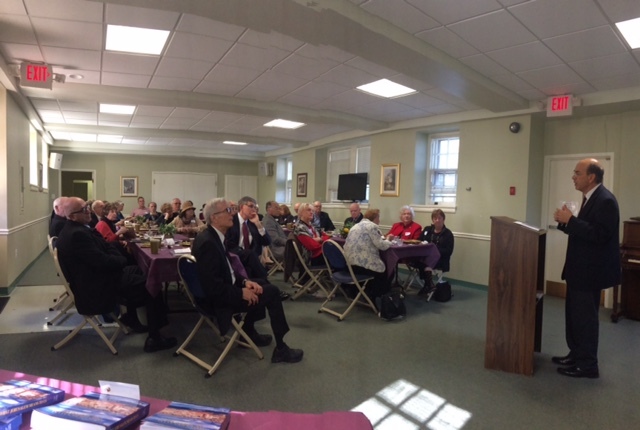 During the Q&A session that followed the presentations, Bishop Graham reinforced Fr. Christiansen’s emphasis on the urgent need to support the hospitals of East Jerusalem, including the Augusta Victoria Hospital. The Friday afternoon roundtable, “Advocacy on and Solidarity with Jerusalem: The Crucial Role of Religious Leaders and Peace Organizations,” moderated by Sir Rateb, was focused on activism and advocacy. Sir Rateb welcomed all participants to express themselves, whether holding a faith-based or non-faith-based perspective. The four panelists represented different vantage points: Jewish, Muslim, Christian, and secular. Ms. Julia Pitner (Executive Director, Institute of Palestine Studies) suggested that we must find new language to promote human rights and to reach out beyond our own circles of like-minded activists in order to engage others. We must integrate religious concepts of the ideal Jerusalem with discussion of the living Jerusalem. Rabbi Joseph Berman (Government Affairs Manager, Jewish Voice for Peace) expressed the religious importance of Jerusalem in Judaism. Affirming the need to integrate concepts of holiness and of justice, he rejected the transfer of the U.S. Embassy to Jerusalem as well as the redefinition of refugees by the Trump administration. Mr. Stephen France, Esq. (Episcopal Peace Fellowship) speculated that because the embassy move has stimulated people to think about Jerusalem, perhaps a coalition of Christians, Muslims, and Jews could work together. 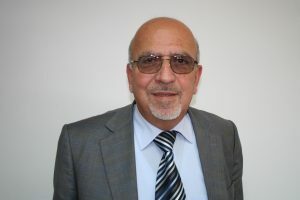 Mr. Mohamed Mohamed (Executive Director, The Jerusalem Fund/Palestine Center) recalled his sadness at the abrupt departure of a Jewish family, whom he had welcomed into the center, when they noticed material about Palestine. Just as he wants the Jerusalem Fund to be for everyone, likewise the city of Jerusalem should be for everyone, as UN Resolutions 181 and 194 have mandated. The majority of this unique, two-hour session, which included representatives of diverse organizations and perspectives, was devoted to interactions among conference attendees, panelists, and the moderator. Sir Rateb asked how we can work together to ensure that Jerusalem is for everyone. He lamented the fact that each organization seems to be preoccupied with its own projects and cannot find much time to support those of other organizations. He urged us to find a project that we can all support together. 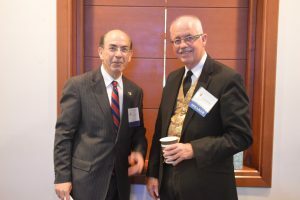 Dr. Stephen B. Corbin suggested that we need a highly respected religious leader to bring a coalition of religious leaders together as a strong, effective bloc to oppose Christian Zionism. A conference attendee promoted the importance of contacting political representatives persistently. Having worked on Capitol Hill for many years, she has noticed a growing awareness of Palestine among Congressional staffers and therefore believes that it will be fruitful to continue the work of advocacy. Panelist Stephen France mentioned that the Episcopal bishops are composing a pastoral letter to educate the people in the pews about Jerusalem. This is an instance in which the communication between church leaders and the people in the pews can be strengthened. Reiterating the dire effects of the U.S. financial cuts affecting Palestinian hospitals, which had been mentioned in the morning Plenary Session, Former Ambassador David Mack suggested that this is a project on which many organizations can agree and work together. Sir Rateb suggested that since Jewish Voice for Peace is experienced on The Hill, they can take the lead for advocacy, and the rest of us can support the effort. Another organization can spearhead an effort for the hospitals, supported by other organizations. At the end of the discussion, panelists and conference attendees urged all activists not to give up hope, but to think in terms of working cooperatively for positive change. Prof. Saliba Sarsar invited participants to continue this vital conversation on the following day of the conference and in the weeks to come. A celebratory banquet was held at Maggiano’s Little Italy Restaurant in Washington, DC. 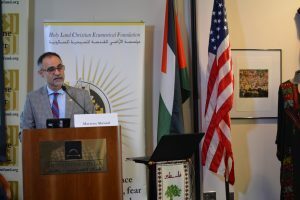 HCEF extended the invitation to many representatives of partner organizations, venders, volunteers and supporters over the 20 years of service to the Palestinian people to replace despair with HOPE, fear with human SECURITY and humiliation with DIGNITY.” Imam Yahya Hindi, Muslim Chaplain at Georgetown University, delivered the interfaith prayer. Renee Rabie Sagnay, the Banquet Chair, and Dr. Stephen B. Corbin, the Master of Ceremonies, welcomed all. The HCEF film, “Keeping Our Vision Alive” was shown, which portrayed HCEF’s 20-year transformative impact and accomplishments. 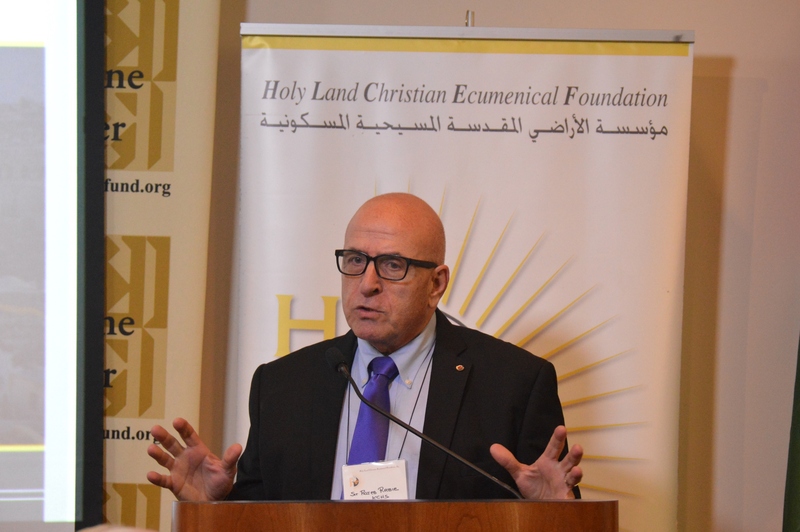 HCEF guests shared their reflections of HCEF and how it is essential in advancing the faith, hope, and resilience of Holy Land Christians and others. Among them are His Excellency Agshin Mehdiyev (Ambassador/Permanent Observer of the Organization of Islamic Cooperation to the United Nations), His Excellency Ambassador Dr. Riyad H. Mansour (Permanent Observer, Mission of the State of Palestine to the United Nations), Father Drew Christiansen, SJ (HCEF Co-founder and Distinguished Professor, Georgetown University), Father Michael McDonagh (Advisor to the Apostolic Administrator of the Latin Patriarchate of Jerusalem), Elias Saboura, Esq. (HCEF Board of Directors member), Sayyid Syeed (President of Islamic Society of North America (ISNA), Former Ambassador David Mack (Elder at the National Presbyterian Church), Maria Elena Nazar Kafati (KTH alum), and Prof. Saliba Sarsar, Ph.D. (Chair of the HCEF Research & Publication Committee and Professor of Political Science at Monmouth University). Sir Rateb Y. Rabie (Founder, President, and CEO of HCEF) was praised for his commitment and leadership in advancing HCEF’s mission and vision in the Holy Land and elsewhere around the world. 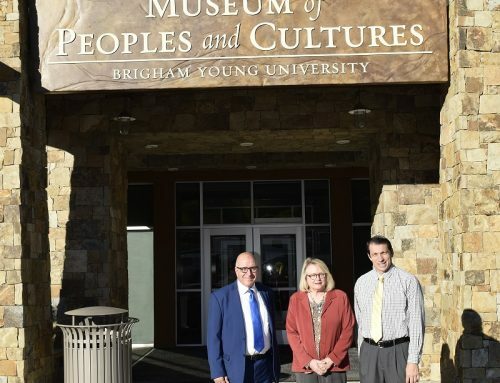 The conference was reconvened on November 3 with welcoming remarks by Dr. Stephen B. Corbin who discussed recent reports from the Pew Research Center about how the American public views the Israeli/Palestinian conflict. The data he cited was collected between 2001 and 2016 and, therefore, does not reflect actions of the Trump administration. Increasingly, liberal Democrats are sympathizing with Palestinians over Israelis on issues related to the occupation, the data reveals. But among conservative Republicans, there has been little change in attitude over this same time period. And among conservative/moderate Democrats, opinions have not changed significantly either. What this means, concluded Corbin, is that HCEF and other pro-Palestinian organizations need to focus on well-targeted messages to key groups. One promising development is the growing opposition among liberal American Jewish groups to the expansion of Israeli settlements in East Jerusalem and the West Bank. The first morning session, “Palestinian Geopolitical Status under the Israeli Occupation, with a Special Focus on East Jerusalem,” moderated by Dr. Hanna Hanania (member of the HCEF Board of Directors), focused on the effects of Jewish settlement expansion and the separation wall. 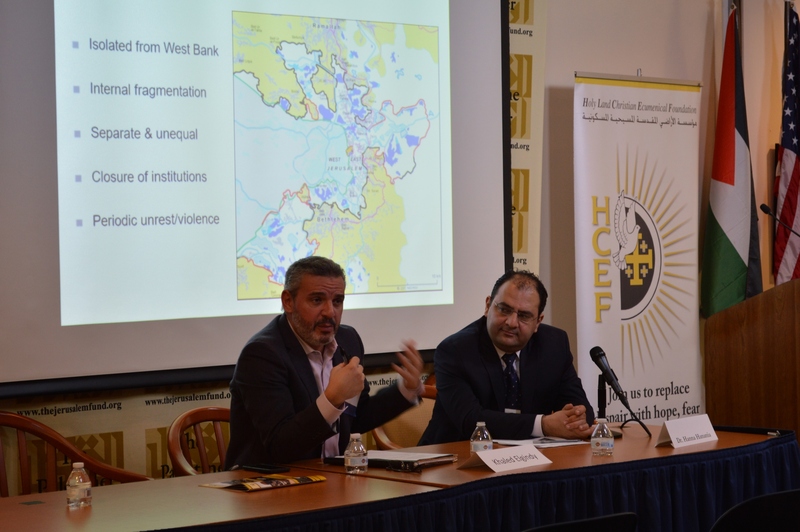 Dr. Hanania mentioned data from B’Tselem on the disastrous consequences of Israeli actions in the West Bank. Dr. Jad Elias Isaac (General Director, the Applied Research Institute–Jerusalem) addressed the conference via Skype, presenting maps and charts demonstrating the continual swelling and metastasis of settlements and outposts as well as the spate of recent Israeli legislation harmful to Palestinians. He stated that the actions of the Trump administration have turned the U.S. Letter of Assurances to the Palestinians (October 18, 1991) into a “joke.” In 1992, months after the Letter of Assurances was signed, there were 248,000 settlers in the West Bank. Now the official count is 816,192 settlers. He outlined the history of the partition since 1948 and used the Bedouin town of Khan al-Ahmar as a current example of the forced displacement of Palestinians. 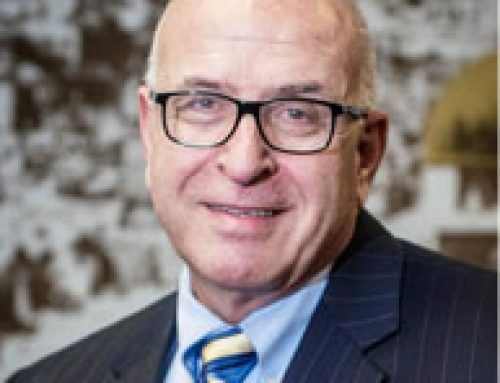 “I believe that the outposts (settlements unauthorized by the Israeli government) are the most dangerous threat to the peace process,” he stated. Not only is Israel blocking Palestinians their legitimate access to the Supreme Court to file legal protests, their government is acquiring even more land in and around Jerusalem through gerrymandering tactics. Moreover, Jerusalem identity documents are being revoked, leaving Palestinian Jerusalemites in limbo, and meanwhile Palestinian neighborhoods in East Jerusalem are becoming “human warehouses” with increasing population density. Mr. Khaled Elgindy (Fellow at the Brookings Institution and founding board member of the Egyptian American Rule of Law Association) displayed a map showing the isolation of East Jerusalem from the West Bank, its fragmentation, and its unequal status. “Every [settler] house built, every road built is part of a strategic plan by Israel to eventually acquire complete control of the area,” he stated. About 300,000 Palestinians live in Jerusalem, which represent 30% of the population, but they receive only 12% of the municipal budget. They live in walled ghettos and their cultural institutions are deliberately suppressed. Palestinian citizens, in and around Jerusalem, feel a complete sense of abandonment. Cultural, commercial, and educational events and institutions are being shut down. The U.S.-led peace process actually made things worse. It was already dead before President Trump took office but the situation is new and changed with him in power. We need new Palestinian leadership that is cohesive, more strategic, and less dependent on the United States. Both speakers agreed that we are in a new phase of rapid deterioration. During the Q&A session, Dr. Stephen B. Corbin responded to the speakers by stating that the term “occupation” is inadequate to describe what is happening; instead, terms such as “apartheid” and “cultural genocide” would be accurate, he believes. 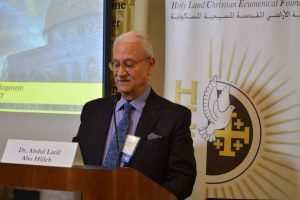 The second morning session, “Enlivening Jerusalem: Christian and Muslim Contributions to the City’s Education, Culture, and Social Advancement,” was moderated by Father John Predmore, SJ (member of the HCEF Board of Directors). He remarked that artistic activity can reveal the beauty and the divine presence in any situation, as in Psalms 146 (“Put not your trust in princes . . .”) and 127 (“Unless the Lord builds the house . . .”). He suggested that we should find more opportunities to integrate culture and faith together. As an example, he cited his experience within a choral ensemble that performed Handel’s Messiah in Arabic for a Jordanian audience. “The people cried,” he recounted. Translating the sacred text of Messiah into Arabic made all the difference, he added, sort of like changing the lens of a camera to enhance clarity. It allowed the singers and the audience to touch the divine. Father Michael McDonagh agreed that “enlivening Jerusalem” demanded people to draw closer to God. “We look to ‘needs’ to guide us when we should be looking to God. Put not your trust in princes. Instead, listen to God.” What do we as a church have to learn? What does the Lord want us to look at? “I think modern Israel does not know what it was chosen for. If we are not attuned to the divine voice, we will be miserably disappointed.” An example is the so-called peace process: year after year, we have been spinning our wheels. Unless the Lord builds the house, in vain is the labor. Put your efforts in the hands of the Almighty and that will enliven Jerusalem. The next speaker, Mr. John Schlageter, Esq. (Executive Director, Bethlehem University Foundation), described how the university was founded as a result of Pope Saint Paul VI’s visit to the Holy Land in 1964. Finding the Christian community in decline, he decided to create new cultural institutions, including Bethlehem University. It is an important place of Christian encounter and identity for those students (25%) who are in the minority of BU’s student body. 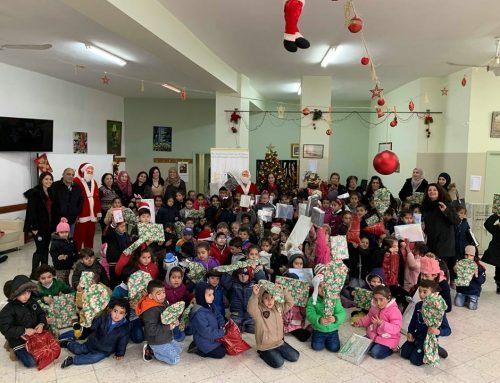 It is also the place where Christians can get to know each other and discover their Muslim fellow students—the place where they can all see each other as Palestinians. Forty percent of the students live in Jerusalem so they pass twice through the Wall every day to attend classes in Bethlehem. Education, he concluded, is the way to build peace and justice in the Holy Land. The HCEF film, “Keeping Our Vision Alive,” was shown again, which portrayed HCEF’s 20-year transformative impact and accomplishments. After lunch the Keynote Address was delivered by Dr. Abdullatif Abuhijleh, P5580 the President of Birzeit University. Originally established as a girls’ elementary school in 1924, the institution grew rapidly and became a fully accredited university in 1972. With a current enrollment of 14,506 students, Birzeit University now stands as the Number One institution of higher education in Palestine and is ranked among the top 2.7% of universities worldwide. Although access to education is a basic human right (according to Article 26 of the Universal Declaration of Human Rights), Israeli forces have closed Birzeit University 15 times. Checkpoints and roadblocks pose serious obstacles to students traveling to classes. Israeli authorities are withdrawing the visas of international faculty members. It is his hope that the international community will put pressure on Israeli authorities to renew the visas of its foreign faculty members. “We had support during the first intifada and that support was essential,” he said. “We need it now more than ever.” Nevertheless, Birzeit University, which currently offers 111 academic programs, is continuing to expand and flourish. International partnerships are necessary in order to maintain the global scope of research and instruction. The following document was read aloud by Prof. Saliba Sarsar and distributed to everyone at the conference. Its purpose is to identify the common ground on which we have all agreed and to provide food for further thought. November 3, 2018, Washington, D.C.
Jerusalem is a city like no other. Nestled deep in the heart of three Abrahamic faith traditions, she carries a special weight in our varied, but interrelated beliefs and images of reality. Although our political goals sometimes intrude into faith issues, it is clear now, more than ever, that Jerusalem’s significance resides in embracing humanity and inclusive relations. Jerusalem cannot belong exclusively, or even predominantly, to one people or one religion. The inhabitants of Jerusalem must have a dignified life and have equal access to housing, jobs, education, medical care, municipal services, political participation, cultural activities, and religious sites. Legal protection is essential. All inhabitants of Jerusalem must be equal before the law. Christians, Muslims, Jews, and others everywhere should advocate for preserving Jerusalem’s Status Quo and for maintaining her as the inclusive center of faith. The Question of Jerusalem should be addressed through negotiations, not dictation; through fairness, not partiality. Both the process and its outcome must be just and inclusive. Only when Jerusalem is at peace can she fulfill her true universal character and be the center of reconciliation for humanity. We commit ourselves to bringing together religious leaders, peace organizations, and others of good will in support of Jerusalem, our collective home. We plan to do so in an organized, systematic, and systemic manner. 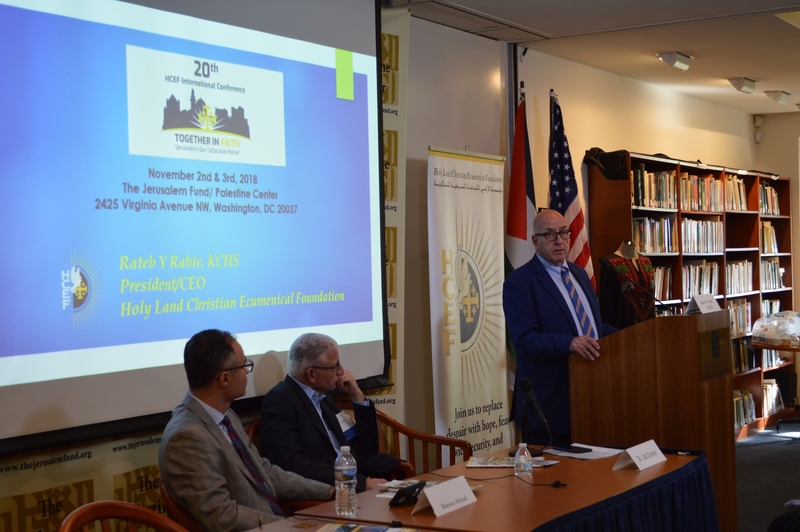 On Sunday, November 4, 2018, the National Presbyterian Church (NPC) hosted three people who spoke passionately about Jerusalem: Sir Rateb Y. Rabie, KCHS (HCEF’s Founder, President, and CEO); Father Michael McDonagh (Advisor to the Apostolic Administrator of the Latin Patriarchate of Jerusalem and Archbishop of Jerusalem); and Prof. Saliba Sarsar (Chair of the HCEF Research & Publication Committee and Professor of Political Science at Monmouth University). Each addressed Jerusalem’s importance and how her significance resides in embracing humanity and inclusive relations. They also discussed the new edited HCEF book What Jerusalem Means to Us: Christian Perspectives and Reflections, which contains the personal perspectives and reflections on Jerusalem of 23 leading Palestinian Christians and other Christians of various backgrounds. Among the contributors are Prof. Sarsar, the book’s editor, Sir Rateb, Fr. McDonagh, Dr. Rev. David A. Renwick (NPC’s Senior Pastor), and Former Ambassador David Mack (NPC Elder). 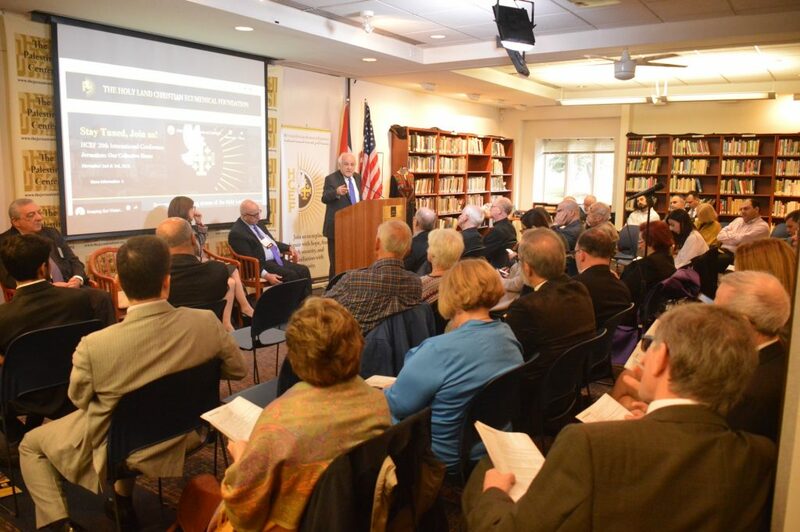 In addition, Prof. Sarsar talked about his recently published book, Jerusalem: The Home in Our Hearts, which is his family’s multigenerational story of faith, hope, and resilience in the Holy City. The audience was most receptive and engaged the speakers in dialogue.